That is fantastic! What a great commercial. I love super bowl commercials in general, but that one was really awesome . That was really funny and I can't wait to see the product placement in the next period film that comes out. I think that suit of armour is a CGI. I'm not an expert on such things, but I paused the video and looked at it, and the lighting and positioning looked a little off. These days, if it's done well, it's impossible to tell. That armourer would be Tony Swatton of Sword and Stone... builds crazy cool stuff for Hollywood and the "adult / Sci Fi industry" actually have some armour he made for me back when I was doing Landsknecht stuff in CA. 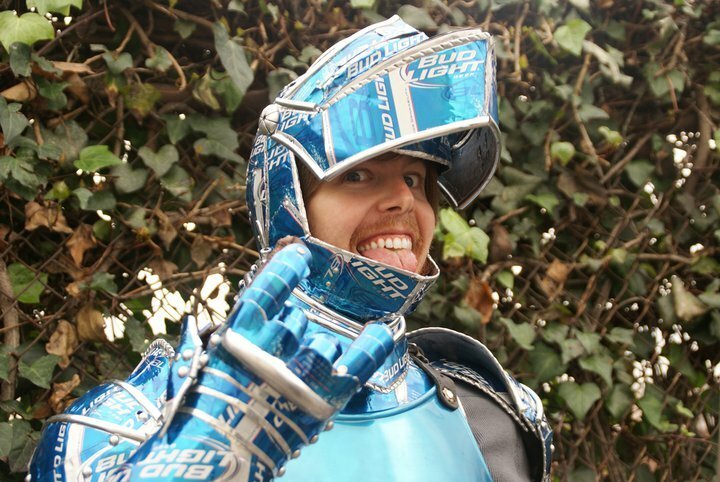 got some more info about how he made it... apparently he stuck the beer can cut outs on top of a suit of armour he already had... so if anyone wants to make their own.... start drinking beer and lots of super glue.